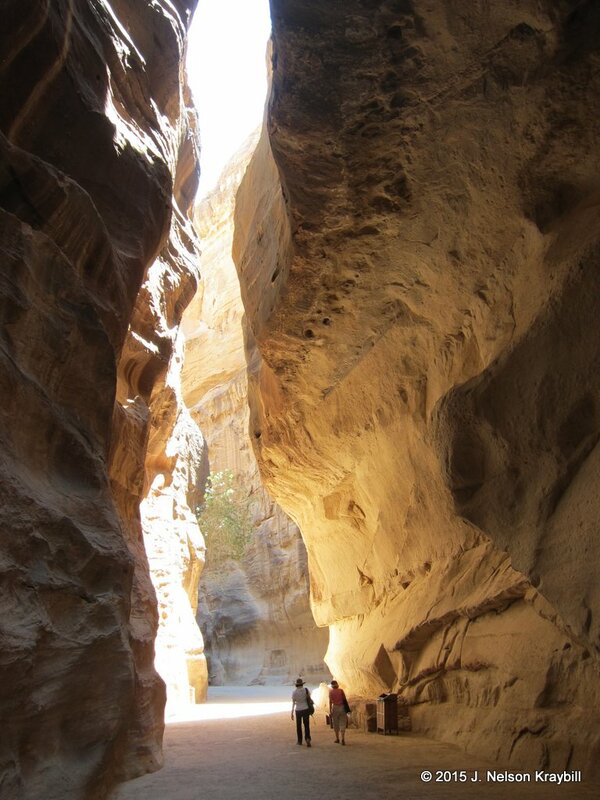 Entrance to ruins of ancient Petra is through a half-mile-long canyon called the Siq. Massive rock formations in southern Jordan still echo tragedy from the Old Testament era. In the eighth century BC, people of Judah captured ten thousand Edomites from this region, “took them to the top of Sela, and threw them down . . . so that all of them were dashed to pieces” (2 Chron. 5:12). Sela is Hebrew for “rock,” likely this place later called Petra (also meaning “rock” in Greek) southeast of the Dead Sea. Visitors to ruins of Petra today enter through the half-mile-long Siq—perhaps the very canyon into which Edomites were hurled. At places two hundred and fifty feet deep, the canyon served as a secure entrance to the thriving trade city of Petra in the New Testament era. It is possible that Paul the apostle walked through this tunnel-like corridor shortly after his conversion. Paul had to flee Damascus, and headed south to “Arabia” (Gal. 1:17). The most logical place he would have gone is Petra, capital of the Nabataeans who controlled spice trade caravan routes stretching to India. At that time King Aretas of Petra governed territory as far as Damascus, two hundred miles to the north. When Paul returned to Damascus from Arabia, “the governor under King Aretas guarded the city . . . in order to seize me, but I was let down in a basket through a window in the wall, and escaped from his hands” (2 Cor. 11:32-33). Commonly called “the Treasury,” this giant sculpture looks like the facade of a Greek temple. Made in the New Testament era, it possibly was the tomb of King Aretas mentioned in 2 Corinthians. Sunlight reflected from nearby cliffs creates a pink and orange glow. Why might King Aretas of Petra have wanted Paul arrested? Did Paul evangelize in Petra, a city full of pagan religion, so upsetting Aretas that the Nabataean king ordered him arrested in Damascus? If Paul brought the good news of Jesus to Petra, he was in the heart of Edom, a region that often was hostile to Jews. Esau, who wanted to kill his twin brother Jacob, lived in Edom. Edomites denied Israelites permission to pass through this territory when they were on their way from Egypt to Canaan (Num. 20:14–21). 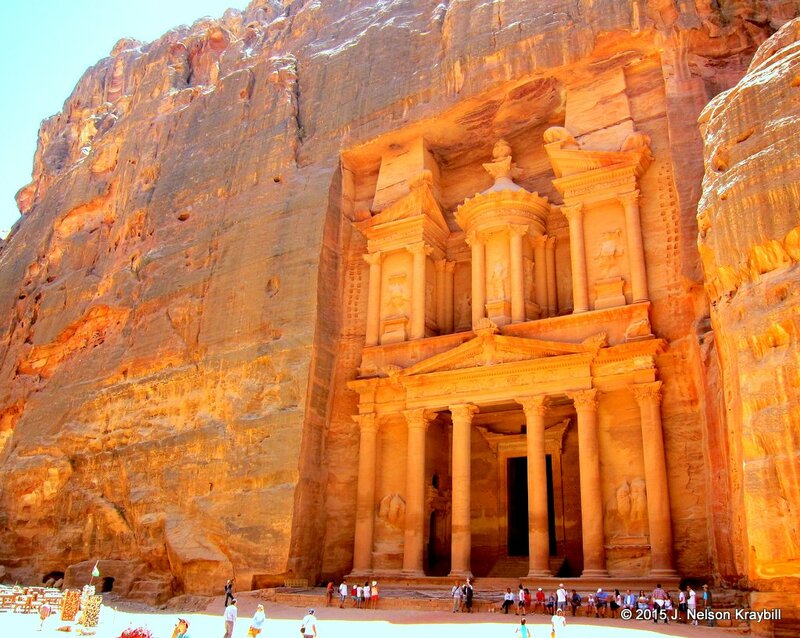 After Paul’s conversion, he went from Damascus to “Arabia,” possibly Petra. When Babylon destroyed Jerusalem in 586 BC, Edomites gloated, “Tear it down! Tear it down! Down to its foundations!” (Ps. 137:7) Herod the Great, hated by many when he ruled Judea in the first century BC, came from an Idumaean father and Nabataean mother. Idumeans were descendants of the Edomites, and Nabataeans were Arabic people who conquered them. Contrary to impressions given by Indiana Jones in Raiders of the Lost Ark, spectacular buildings carved into stone at Petra really are just facades for what likely were Nabataean tombs. If Paul indeed walked by these monumental structures soon after his conversion, he was on a mission to find reconciliation with people long hated and feared by his Jewish ancestors.